Permanent Representative of Ukraine to the United Nations Volodymyr Yelchenko says that a UN resolution draft presented by Russia on Donbas has nothing to do with peacekeeping, according to 112 Ukraine TV Channel. "We basically expected such a step from Russia, and one should not have hoped that they would draw up a draft resolution that would completely suit both Ukraine and all the others," Yelchenko said. According to him, the draft resolution was presented by Permanent Representative of the Russian Federation to the UN, Vasily Nebenzya; the document was sent to the UN leadership with a request that all members of the UN Security Council could examine it. "If someone reads this draft, at first glance it looks so, you know, innocent – it says right things. But if to go into detail, one can realize it mentions certain absolutely unreal things," he added. Read alsoUkraine's envoy estimates costs of UN peacekeeping mission in Donbas: At least $1 bln a year"Firstly, it has nothing to do with a UN peacekeeping mission, it's about a mission to protect the OSCE mission. Well, imagine the situation: there are unarmed OSCE monitors and they are guarded by UN peacekeepers. I do not see any peacekeeping in this, and I cannot imagine how this can be done technically," the Ukrainian diplomat said. "Secondly, they say in their draft that these UN peacekeepers will be located only along the contact line between the warring parties. It says absolutely nothing about the Russian-Ukrainian state border, which all the problems actually began with. On our part, we insist that any UN mission should be deployed first of all along the border between Russia and Ukraine so that we could get back to the situation that was before 2014," Yelchenko said. What is more, the draft UN resolution submitted by Russia says nothing about the mandate of that mission. Everything in the Russian draft is very ambiguous, he added. Yelchenko did not rule out that Ukraine may submit its alternative resolution. In his words, the Ukrainian delegation in New York City had earlier shared "a set of its ideas and opinions about such operation among all members of the UN Security Council in working order." "We've got everything, all this is known, but the Russian delegation constantly signaled to us and others that it would block any attempt to formalize it as an official paper and adopt a resolution of the UN Security Council. I.e. it threatened to use its right to veto. That is why we could not move forward in this matter," Yelchenko explained. At the same time, he added: "We have everything, it is ready. It was handed over to our partners. I think we'll see, we'll submit and distribute our alternative document in a day or two, if needed. Another option is to work on the basis of the Russian draft. It does not mean that everything there should remain the way they put it. There are 15 members of the Security Council, not just Russia alone, and all of them will participate – it's teamwork." 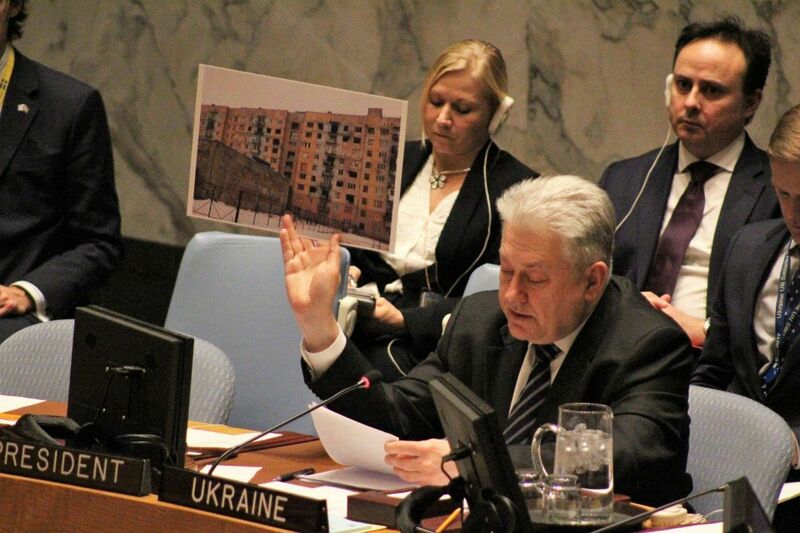 Yelchenko also noted that the work should begin only upon agreement of certain basic principles for the deployment of UN peacekeepers throughout the entire territory of Donbas, including the state border, and there should not be any Russians in the mission. As UNIAN reported, Ukrainian President Petro Poroshenko said on August 22 he planned to send a motion to the UN General Assembly the coming month, asking for deploying a peacekeeping mission in Donbas. He recalled that during a phone call of the Normandy Four leaders of Ukraine, Russia, Germany and France on July 24 he pointed out to the need to introduce a UN peacekeeping mission in Donbas with a UN Security Council mandate. Russian President Vladimir Putin announced on September 5 he supported the idea of UN peacekeepers in Donbas but only if they are deployed along the contact line to ensure the safety of OSCE SMM observers. He said he had instructed the Russian Foreign Ministry to introduce a relevant resolution for consideration by the UN Security Council. At the same time, he noted that the issue could not be resolved without direct contact with representatives of the self-proclaimed Donbas republics. Later, Putin's press secretary, Dmitriy Peskov, said there were no modalities as for the deployment of peacekeepers in Donbas. The issue is due to be discussed in the Normandy format, he added.